The project which originated in the province of Matanzas is expanding all throughout Cuba. Please click on the provinces to see the corresponding representatives of Proyecto CUBABAT. Monzón obtained a degree in Biology in 1999. He specializes in Biospeleology and Chiroptology. Currently, he is president of the speleological group “Jorge Ramón Cuevas,” which is part of the Speleological Society of Cuba (Sociedad Espeleológica de Cuba (SEC)). He is also president of the Scientific Council Speleogic Committee, Matanzas (Consejo Científico del Comité Espeleológico de Matanzas (CEM)). His research has focussed on the ecology of Cuban bats, and thermal traps within hot caves. He is the coordinator of the Program for Bat Conservation Cuba for the province of Matanzas (PCMCu). He is member of the Scientific Advisory Board for the Conservation of Flora and Fauna (Consejo Científico Asesor de la Empresa Nacional para la Conservación de la Flora y la Fauna) and a specialist for the Foundation “Antonio Núñez Jiménez” for Nature and Humanity (la Fundación “Antonio Núñez Jiménez” de la Naturaleza y el Hombre (FUNAT)). He is an instructor in Biospeleology and Ecology for the Speleological Society of Cuba (SEC). He also consults in the province of Matanzas in the management of protected areas in Cuba developed by CITMA. Humberto became licensed in Socio-Cultural studies in 2011. He is president of the speleological groupo “Félix Rodríguez de la Fuente.” He is a member of the Speleological Society of Cuba (Sociedad Espeleológica de Cuba (SEC)) and of the Scientific Council Speleogic Committee, Matanzas (Consejo Científico del Comité Espeleológico de Matanzas (CEM)). His specialities include Geology, Geomorphology, Petrology and Caving. His studies in caves have brought him into a study of the ecology of bats since the two topics are closely entwined. He works for CITMA (Áreas Protegidas del centro de Estudios Ambientales de Matanzas). He is an instructor in Geology and Petrology in the Speleological Society of Cuba. 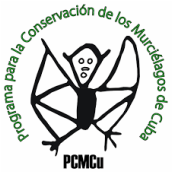 He is a coordinator for the Conservation of Bats in Cuba for the province of Matanzas (PCMCu). Clark has been working in speleology since 1988. He is Vice-President of the Speleological Committee of Matanzas, and is a member of the Speleological Society of Cuba. He works for Environmental Services of Matanzas (Centro de Servicios Ambientales de Matanzas (CSAM)). His research has centred around cave exploration and cartography (and Clark has participated in mapping out several of Cuba’s complex cave systems). He has participated in international and national scientific events such as Proyecto Bellamar, and the monitoring of bat populations along the northern coast of Matanzas. Melissa is a graduate of the University of Toronto where she received a Bachelor of Science degree in Zoology, and of St. Lawrence College in Kingston, Canada, where she attained her qualification as a Registered Veterinary Technician. Melissa has always loved animals, but has held a special place in her heart for bats. She has been lucky enough to travel to various places in the United States, Central and South America to help participate in bat surveys and conservation. By chance, Melissa became involved in Proyecto CUBABAT in 2012 where, with the support of Animal Experience International, she helps organize expeditions to Cuba to help provide funding for field equipment. In the summers of 2014 and 2015, Melissa acted as Chiroptologist for Operation Wallacea on the Island of Dominica. She has also assisted with a PhD project out of the University of Western Ontario which involved radio tracking silver-haired bats, Lasionycteris noctivagans. Melissa is one of the co-creators of this website. Grau has been working in speleology since 1989. He is currently the president for the Speleological Committee in Matanzas and belongs to the Speological Society of Cuba (Sociedad Espeleológica de Cuba (SEC)). He works for the Foundation “Antonio Núñez Jiménez” for Nature and Humanity (la Fundación “Antonio Núñez Jiménez” de la Naturaleza y el Hombre (FUNAT)). His research has centred on the exploration and cartography of the complex cave systems of Cuba and other countries. He is a consulting member of the National Centre for Protected Areas (Centro Nacional de Áreas Protegidas (CNAP)) and a group advisor for Nature Tourism Cuba (Grupo de Turismo de Naturaleza de Cuba). Grau is the coordinator for proyecto “Bellamar” 3D image presentation and for the protection of Cuban heritage karst systems, in which he works along with specialists from the Italian Speleological Society and the French Speleological Federation. He directs the management of Caverna Santa Catalina (a national monument) which is categorized as an “Outstanding Natural Element” (Elemento Natural Destacado (END)) of National importance.